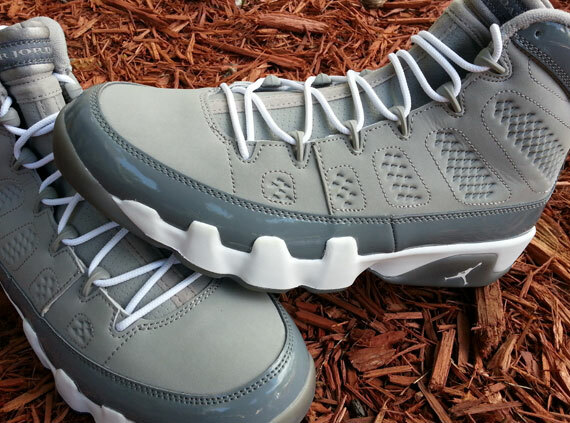 When it was announced back in spring as a Q4 2012 drop, the ‘Cool Grey’ Air Jordan IX Retro instantly became one of the holiday season’s highest profile releases. But the past few months have brought forth several new styles, and after the ‘Johnny Kilroy’ capsule brought the total to nine IXs for ’12, it’s worth checking in with this beloved style to see where they rank on your revised list of priorities. Dropping two weeks after the ‘Motorboat Jones’ alias finale and a week or a little more before the traditional holiday Elevens (Bred this time around, of course), the Cool Grey 9s have some serious competition (and what about that Doernbecher rumor?!). Sneaker News will keep you posted with all updates as we approach the December 15th release date and you can see a new set of images below in the meantime.